Intrapericardial diaphragmatic hernias are most commonly described as a consequence of high impact trauma. Congenital pericardial herniation usually is detected in infancy. Herniation after iatrogenic creation of peritoneal and pericardial windows is extremely rare, with less than a dozen cases described in the literature. The diagnosis should be considered in patients whose complaints are not resolving after having undergone a pericardial window procedure. A 56 year old woman presenting with chest pain and fatigue was found to have a pericardial effusion. Treatment with non-steroidal anti-inflammatory agents for 4 weeks followed by treatment with prednisone did not result in improvement of symptoms. On follow up echocardiography, evidence of right atrial collapse was demonstrated. A pericardial drain was placed. The patient then underwent creation of a pericardial window via a subxiphoid approach. Over 300 ml of hemorrhagic fluid was removed. A pericardial biopsy was taken (5 x 3 x 0.7 cm) and a 19 French Blake drain was placed in the pericardium. The left pleural cavity was also drained with a 19 French Blake drain. The fascia was closed with PDS. Pathology showed fibrinous pericarditis with focal perivascular lymphocytic infiltration consistent with chronic inflammation. The patient initially recovered well postoperatively; however, after 3 months was still unable to exercise and complained of fatigue and chest pain. It was not possible to wean her off Prednisone. A cardiac MRI was performed at 4 months postoperatively. This demonstrated herniation of fat and part of the left lobe of the liver intrapericardially. A mild degree of compression of the right ventricle was found. The patient underwent laparoscopic reduction of the intrapericardial hernia. The pericardial defect measured 8 x 8 cm. A significant portion of the greater omentum was in the pericardium and adherent to the heart. After reduction of the omentum, a portion of the left lobe of the liver, adherent to the heart, was also reduced, requiring dissection and lysis of adhesions. The hernia defect was closed with interrupted U stitches of 0 braided polyester sutures affixing a polytetrafluoroethylene (Goretex) mesh to the diaphragmatic defect with at least 2 cm overlap in all directions. The postoperative course was uneventful. 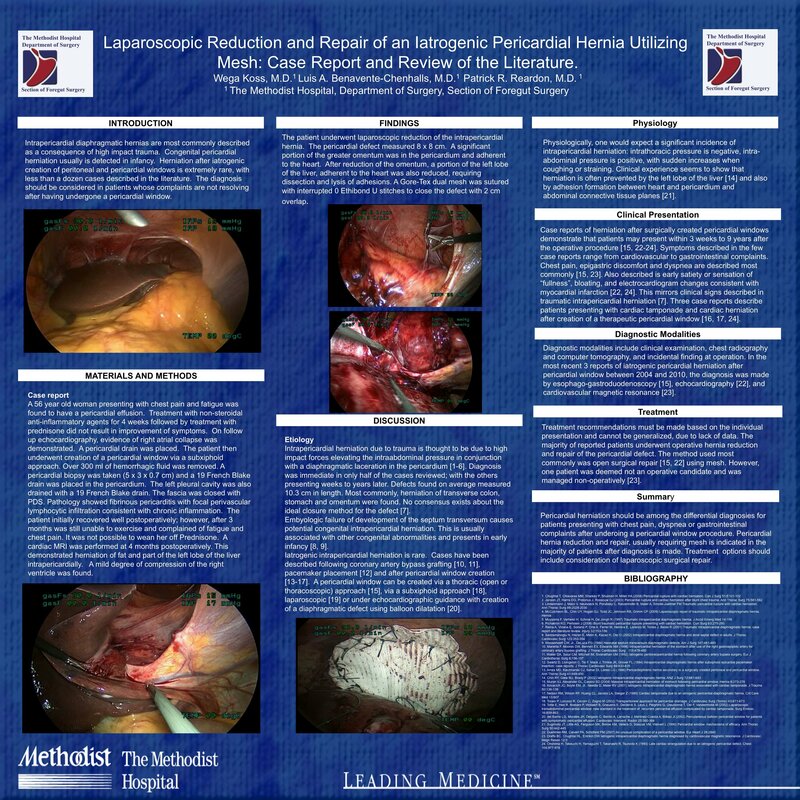 Laparoscopic reduction and repair of an iatrogenic, incarcerated pericardial hernia utilizing mesh can safely and effectively be accomplished with excellent short-term outcomes.